Product prices and availability are accurate as of 2019-04-24 19:31:23 MST and are subject to change. Any price and availability information displayed on http://www.amazon.com/ at the time of purchase will apply to the purchase of this product. 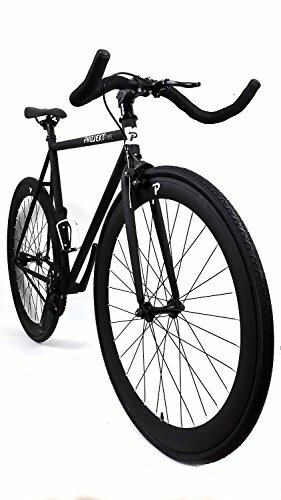 Projekt Fixie created the ultimate fixie road bike starting with the simplicity and elegance of an urban geometry frame and straight fork made from durable high tensile steel. A Neco threadless Headset holds bullhorn pursuit handlebars with handlebar tape for a smooth comfortable ride. The classic road style saddle gets the job done, without frills, and it keeps the weight down. 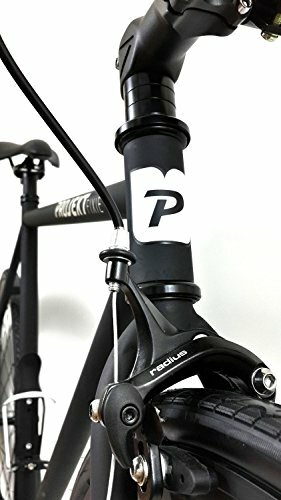 Radius front brakes stop when asked and are easily removed for a projekt ride. Our hubs are Projekt Quando Hubs, specially made for our bikes.. Kenda Kwest 700 x 28c tires give you quick control and great floor contact. Pressure retention is courtesy of 60mm Presta valves. Wellgo pedals and cages connect you to a Lasco three-piece sealed bearing crank set. The gear ratio is 44:16 with 74.25 gear inches using a KMC chain. All this joy comes out with a weight of 22-24 lbs., depending on size. Our favorite pursuit style handlebar with drop for mulitple riding positions. 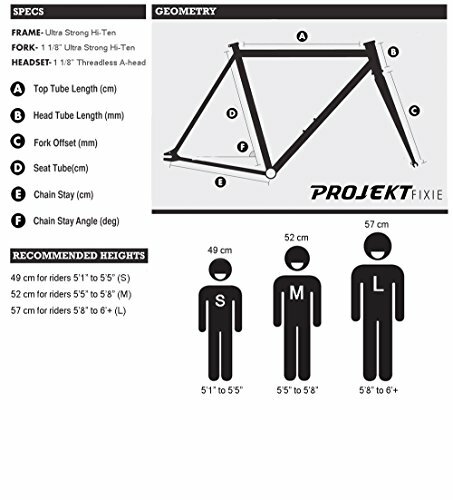 Track bike frame provides aggressive ride, and Projekt has eliminated all cables and wires from bike's design except for simple front brake, making it sleek and minimal Brand name components including tough 700 x 28c Kenda Tires and Tubes, Grips and KMC Chain. Classic, streamlined fixed gear bike designed for urban road warriors Front radius brake with radius lever, saddle, ultra-strong forged alloy 44T crankset, and sealed cartridge bottom bracket Classic pin-riveted BMX pedals, SUPER DEEP-V double-wall 700x28C rims, Quando hubs (F 100-millimeter, R 120 fixed/free cogs, 16T), and 700x28C tires. Disclaimer: Bottlecage sold seperately.